I rose early this morning to get some work done, but by my third cup of coffee I found myself thinking of Hendrickson hatch on my favorite northern Wisconsin freestone river. Looking at some of my Ephemerella subvaria photos of the winged adults I tried to think what Pearsall's Gossamer silk thread color I might use to create a soft hackle imitation. I chose a covert feather from the shoulder of a mallard wing. I think I need to try some other bird feathers. Suggestions? I think I would use 6B silk and gray partridge. I don't have 6B, nor have I ever seen a spool of 6B. I'm not sure I would change anything about the fly (beautiful), but if you are looking for options, you may want to try a version with waterhen covert feather for hackle. I believe waterhen would be a little darker gray, when compared with the mallard feather. I like your choices for the body construction. Choosing the silk color (underbody) and controlling the overall color with the dubbing, works very well. As I look back and forth between the real insect, and your fly pattern, you have done a nice job matching coloration. Have you dipped the fly in water yet? It is always worth checking fly color after the fly is wet, since that is going to be the closest to the appearance when fishing the fly. Materials generally shift (darken) several shades darker once they are wet. I love this sort of tying mimicry. Your insect photos create a strong foundation, for imitative tying. Ray, I don't own any waterhen. I hoping to use more common state-side materials. I do keep water in a container next to me to see how my fly concoctions look wet. pine squirrel fur over slaminberry silk thread after dropped in water. Still tweaking the pattern. It's what the trout tell me that really counts. I tried one as Bob suggested. Pearsalls 6B touch dubbed with light mole for the body and light Partridge Hackle. As John alludes it's what the trout says that counts. Trout can't count and they ain't got no money but they sure can be picky at times. Trout can't count and they ain't got no money but they sure can be picky at times. And trutta don't care which way the quills wings are pointed either, Tom. I couldn't pass that up. I don't know those northern freestone rivers like you, but on the rare occasions I encounter Hendricksons in the spring creeks of SW WI, this is my current choice for trout feeding under the surface. It's similar to your fly, but with woodcock hackle. Really interesting thread and beautifully tied flies. I think the colour of the body is pretty spot on and like the hackle. My question would be are U intending to fish these as duns and how do you intend to fish them? Might seem like a stupid question but I'd be interested to hear how others would approach this from a fishing perspective. 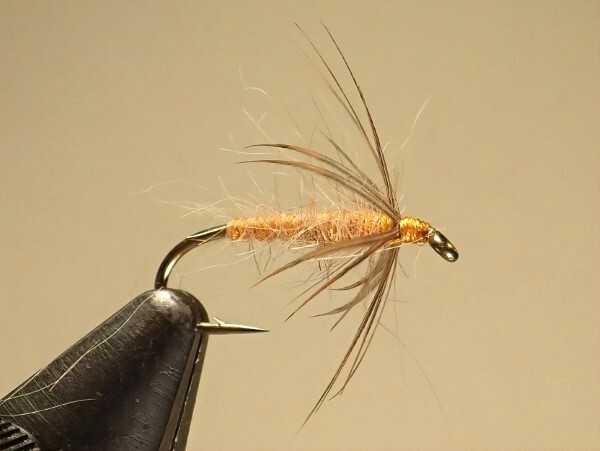 If I were to construct this fly to imitate duns I would have tails and some seals fur in the dubbing blend, a slightly more pronounced and scruffy thorax and possibly a turn or two of undersized dry fly hackle hidden behind the soft hackle. The seals fur sheds water easily when false cast and helps keep the fly in the film/riding higher. The dry fly hackle if used would support the soft hackle material and also aid keeping it riding higher for longer and the tails would all help keep the fly in the correct orientation. fly_fischa, not a stupid question at all. First, I like to tie flies based on hatches I fish and using examples of the actual insects. 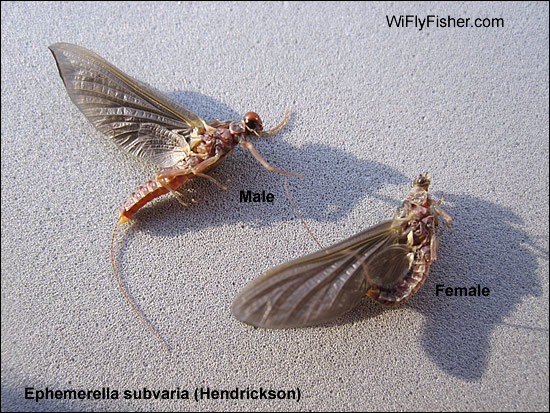 The Hendrickson hatch (Ephemerella subvaria) can be an awesome hatch when you hit it right, which used to be a lot easier to predict than these days with the changes in weather patterns. The hatch generally lasts for 2+ weeks and can be a lot of fun to fish in the Spring. I have not fished a soft hackle for this hatch. I am usually using a Sawyer's PT nymph deep, then a floating PT nymph, then a more typical modern day emerger, finally a comparadun and than if I see the spinner fall a rusty spinner. So using a soft hackle pattern will be a first for me. I plan on using it "under" the film, dead drift casting upstream when conditions warrant it. I will add some imitations with a trailing shuck. My best fishing during the Hendrickson hatch recently has been with a PT nymph. Although I love to throw a comparadun to a riser. Below are two really nice browns rising tight against the tree roots. I lost them both. I didn't think they were that big until they felt the steel.